Showing of “Maudie” in Clyde River, March 8, 7:00 p.m.
Central Parish Women’s Morning Out Group is hosting another showing of the movie “Maudie” at Burnside Presbyterian Church on Tuesday, March 8th at 7:00 p.m. Free will donation at the door. A light lunch will be served after. All are welcome to attend. 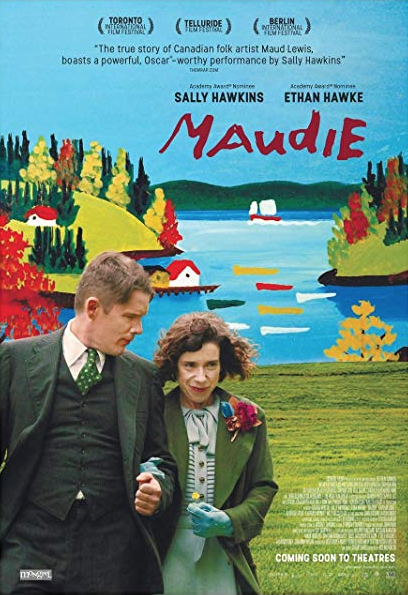 Based on a true story, Maudie follows the unlikely romance between Canadian folk artist Maud Lewis (played by Sally Hawkins) and reclusive fishmonger Everette Lewis (played by Ethan Hawke). Central Parish Women’s Morning Out Group is having a showing of the movie “Maudie” at Burnside Presbyterian Church on Tuesday, September 18th at 10:00 a.m. All are welcome to attend. There will be refreshments following the movie. Donations will be accepted. For more information, please call Millie Kikkert at 902-675-3061. Art in the Park: Saturday, July 21, 9:00 to Noon, Murchison Place Park (shine or light rain): Art in the Park welcomes all levels of painters, especially the beginner. Come on out for an enjoyable morning of painting with new and old friends under the dappled canopy of the park. We also welcome those who enjoy watching art being created. All are invited to join a free demo and painting lesson in an interactive workshop style with artist Julia Purcell, starting at 9:30 am. Get started working in Plein Air painting and learn to develop a well-built start for your painting by using a view finder to shape a limited focus, plus many other painting insights. Bring your own painting materials and easel if you have one. View finders will be provided. If you plan to participate in this lesson, we ask you to pre-register by emailing juliampurcell@gmail.com. Coffee provided. There is a washroom on site. Canada Day Celebrations: Sunday, July 1, 12:30 to 2:00, Riverview Community Centre: It’s a birthday party! Be a kid again or still. Enjoy hotdogs, cupcakes and ice cream. Help us raise the flag, sing the anthem and celebrate Canada’s big day. Strawberries and Ice Cream Social: Wednesday, July 11, 6:30 to 8:30, Riverview Community Centre: The big summer event for Clyde River Women’s Institute is, of course, the annual Strawberries and Ice Cream Social where young and not so young gather to enjoy the scrumptious desserts and meet friends and neighbours. Admission at the door. Art in the Park: Saturday, July 21, 9:00 to Noon, Murchison Place Park (shine or light rain): Art in the Park welcomes all levels of painters, especially the beginner. Come on out for an enjoyable morning of painting with new and old friends under the dappled canopy of the park. We also welcome those who enjoy watching art being created. All are invited to join a free demo and painting lesson in an interactive workshop style with artist Julia Purcell, starting at 9:30 am. Get started working in Plein Air painting and learn to develop a well-built start for your painting by using a view finder to shape a limited focus, plus many other painting insights. Bring your own painting materials and easel if you have one. View finders will be provided. If you plan to participate in this lesson, we ask you to pre-register by emailing juliampurcell@gmail.com. Coffee and water provided. There is a washroom on site. The Clyde River Burnside Presbyterian Women’s Morning Out group is selling one of their paintings entitled “Fishing Village” which would make a good Christmas present. The acrylic painting is a 36″ x 12″ on canvas. The price is $300 with proceeds going towards recent renovations at the church. If you are interested in purchasing this painting, please contact Fred or Millie Kikkert at 902-675-3061. 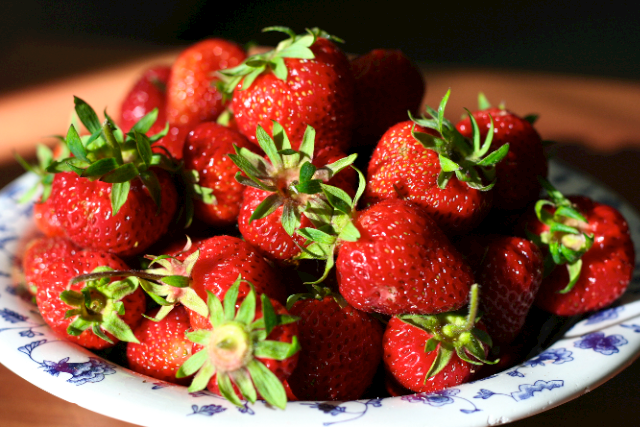 The big summer event for Clyde River Women’s Institute is, of course, the annual Strawberries and Ice Cream Festival where young and not so young gather to enjoy the scrumptious desserts and meet friends and neighbours. Admission at the door. The museum featuring a collection of artifacts and heritage photos will be open for tours. Art in the Park: Saturday, July 22, 9:00 to Noon, Murchison Place Park (shine or light rain). Art in the Park welcomes all levels of painters, especially the beginner. Come on out for an enjoyable morning of painting with new and old friends, under the dappled canopy of the park. We also welcome those who enjoy watching art being created. All are invited to an optional demo and free painting lesson in Plein Air landscape painting starting at 9:30 am to 10:30 am. In a workshop style, with local artist Julia Purcell, participants will learn to develop a well-built start for their painting by creating strong compositional thumbnails through the principles of Japanese notan and by using a view finder to shape a limited focus. There will be an explanation of the three properties of color and a discussion of how to implement a color strategy by using a limited palette in landscape painting. Bring your own painting materials e.g. acrylic or watercolor paint. Please include a sketch book and soft pencil such as an 8B. Using an easel is recommended. View finders will be provided. If you plan to participate in this lesson, we ask you to pre-register by emailing juliampurcell@gmail.com. Coffee and water provided. There is a washroom on site. Murchison Place Park is located among the trees at the corner of Trans Canada Highway and Clyde River Road. Clyde River artist Julia Purcell made the front page of the Journal Pioneer on Monday and we want to say how proud we are of her and her work. The following is a reprint of the article that appeared. Painting is one of Purcell’s greatest pleasures in life, and it brings out a world of creativity. “I don’t want to give away my age, but I’ve been painting for 40 years. It started with my parents who are well-known painters (Joseph and Tela Purcell of Nova Scotia), and it was something I eventually got the courage to try. And with lots of practice I got better,” she added. 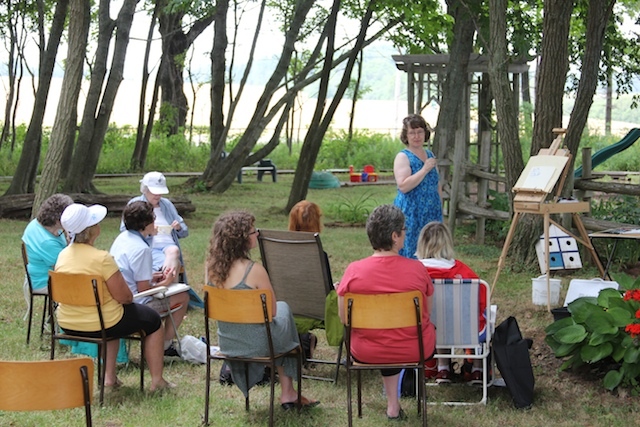 Purcell instructs many on how to paint picture perfect images of P.E.I. Unlike watercolours or acrylics, oil paints are complicated and take a long time to dry. Knowing the chemistry of this paint is almost essential to achieving the proper effect, she said. Several people came to see the artist transform a blank canvas into a stunning landscape painting full of blended brushstrokes with vibrant colours. 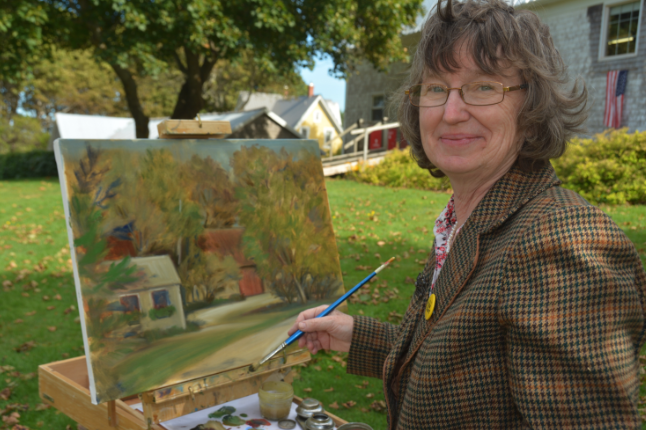 The daylong oil painting demonstration coincided with Purcell’s ongoing exhibition and sale, “Finding My Voice,” which features landscapes, townscapes, portraits and flowers of P.E.I. For more information visit www.Gallery18.com. Editor’s note: Julia leads an art demonstration at our Annual Art in the Park event held each July at Murchison Place Park. Many of her paintings feature the beauty of Clyde River.